South Africa has been chosen to chair the African Union in 2020 and it has taken up a non-permanent seat on the United Nations (“UN”) Security Council for the period 2019 – 2020. Against the background of these high-profile positions, we considered it timely to review the foundations of South Africa’s foreign policy. South Africa’s foreign policy is alarmingly unpredictable, often being at odds with the Department of International Relations and Cooperation’s (“DIRCO”) stated objectives. One cannot but wonder whether any formulated foreign policy guidelines are actually being pursued by DIRCO, or whether South Africa’s behaviour in the international arena is answerable to anything or anyone. For four decades, South Africa’s international relations were dogged by apartheid. By the end of the 1980s, South Africa was one of the most isolated states in the world. During this era, foreign policy was determined exclusively by the executive branch of government, with no oversight mechanism. Nelson Mandela writing on the eve of the first democratic election, argued that, ‘all nations will have boldly to recast their nets if they are to reap any benefit from international affairs in the post-Cold War era’. For South Africa, the ANC envisaged a foreign policy founded upon the pillars of human rights (‘the light that guides our foreign affairs’), the promotion of democracy worldwide, respect for justice and international law; peace as the goal for all nations and foreign relations; the advancement of the interests of Africa; and regional and international economic cooperation. South Africa’s democratic transition was enabled, in no small part, by an active international commitment to democracy and human rights. DIRCO has proclaimed the same commitment ever since. In practice, post-1994 South Africa has seen the back of three presidential periods of foreign policy. Each can be characterised by a certain ideological preoccupation: Mandela’s multilateralism, Mbeki’s Africanism and Zuma’s rogue anti-westernism. Particularly under Mbeki and Zuma, the executive evoked these ideologies and exploited the “sovereignty card” in support of historical liberation struggle relationships or diplomatic relations with Africa. Such bilateral loyalties with global “left-leaners” (like Cuba, China, Algeria, Libya and Venezuela) or African states exhibiting gross and pervasive disregard for human rights tend to bolster the ANC’s ideological purity, revolutionary appeal and commitment to Africa, but are often at the expense of justice and human rights. As a result, South Africa’s behaviour in the foreign policy arena is erratic at best, and often in violation of its foreign policy commitments. Examples abound. The most recent may be DIRCO’s support of Venezuelan dictator Maduro; and the most disastrous, its consistent backing of Zimbabwe’s Robert Mugabe. Others range from the failure to condemn a multitude of human rights abuses (Cuba, China, Belarus, Indonesia, Iran, Uzbekistan, Myanmar, Sudan, Zimbabwe); the abandonment of the SADC Tribunal, and the attempted withdrawal from the ICC; Zuma’s cosying up to Chinese corruption and Putin in pursuit of the nuclear deal; and a running commentary of damage by the current Minister of International Relations, Lindiwe Sisulu. In all of this there seemed to be little awareness that the Government is not only in breach of its proclaimed foreign policy, but of the Constitution of South Africa. South Africa is different from most other states in the supremacy of its Constitution. We would argue that its foreign policy must be reflective of the spirit, purport and objects of the Bill of Rights, with the aim of the executive being to protect, respect, promote and fulfil such rights4. Foreign policy aims should not conflict with the realisation of these rights. This is not to say that relations between South Africa and other countries should not be conducted on the basis of mutual respect. But it should be perfectly clear at the same time that South Africa upholds human rights as the central plank of foreign policy. There are specific duties which the Constitution and subordinate legislation do place on Government. This has been pronounced on time and again in judgments handed down by South African courts over the past two decades. The judgments demonstrate that the Constitution applies not only at the domestic level, but across state borders as well. The following eight judgments demonstrate how South Africa’s foreign policy has to align with the Constitution. 2018: Law Society of South Africa and Others v President of the Republic of South Africa and Others. The most recent case concerning South Africa’s foreign policy is the Constitutional Court’s decision on South Africa’s role in disabling the Southern African Development Community (“SADC”) Tribunal. President Zuma signed the 2014 Protocol on the Tribunal in the Southern African Development community after an unfavourable decision was handed down by the Tribunal against Zimbabwe arising from the illegal expropriation of agricultural land. The Constitutional Court reiterated the supremacy of the Constitution and found, among other things, that the signing of the Protocol (which unlawfully amended an international treaty agreement) and the disabling of the functioning of the Tribunal infringed upon the constitutional right of access to justice. Additionally, the Court found that former President Zuma acted irrationally (and therefore unlawfully) and without authority when signing the disabling Protocol as he, at all times, was required to act in good faith and in a manner consistent with the country’s obligation to uphold the spirit, object and purpose of the SADC Treaty. In this case the South African government concluded an agreement for the procurement of 9.6GW of nuclear new generation capacity from Russia without public participation and tabled the agreement without parliamentary approval. In doing so, the Western Cape High Court found that the National Energy Regulator of South Africa (“NERSA”) had “failed to explain, for one, how it acted in the public interest without taking any steps to ascertain the views of the public or any interested or affected party.” Accordingly, the Court found that NERSA had failed the test for rationality – which is required for any administrative decision. Furthermore, the Minister of Energy’s decision to table the Russian nuclear generation agreement in terms of section 231(3) of Constitution (which is only applicable to international agreements of a ‘routine’ nature not requiring parliamentary approval) was irrational. The Court held that the Minister either failed to apply her mind to the requirements of section 231(2) of the Constitution (requiring parliamentary approval for the tabling of international agreements) in relation to the contents of the Russian nuclear generation agreement, or she deliberately bypassed its provisions for an ulterior and unlawful purpose. The tabling of the Russian nuclear generation agreement was therefore declared unlawful and unconstitutional, and set aside – proving that the circumvention of the correct procedural requirements will invalidate even international agreements concluded with other sovereign states. The South African government, in this case, handed over a Tanzanian citizen, who sought asylum in Cape Town and was implicated in the bombing of the United States (“US”) embassy in Dar es Salaam, to the US authorities. He was to be tried in the US and, if found guilty, could have been sentenced to death. 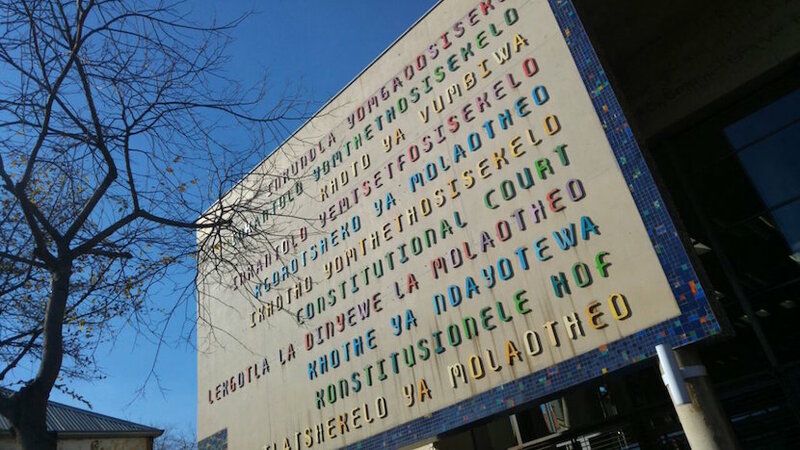 The South African government’s handing over of Mohamed to US authorities and its failure to obtain an assurance from the US that the death penalty would not be imposed on Mohamed, if tried and convicted, was challenged in the Constitutional Court. The Court found that the South African government was not empowered to deport Mohamed to the US. Furthermore, in handing Mohamed over to the US authorities without securing an assurance that he would not be sentenced to death, the South African government failed to give any value to Mohamed’s right to life, his right to have his human dignity respected and protected and his right not to be subjected to cruel, inhuman or degrading punishment. The Court held that the Constitution not only enjoined the South African government to promote and protect those rights but precluded it from imposing cruel, inhuman or degrading punishment. The Constitution also forbade the government from knowingly participating, directly or indirectly, in any way in imposing or facilitating the imposition of such punishment. The Court ordered that the judgment in this matter be brought to the attention of the US courts, thereby attempting to secure the assurance which the South African government had failed to do. As a consequence of this intervention, Mohamed was not sentenced to death in the US. The Constitutional Court was required to determine whether or not a group of South African mercenaries, who were arrested in Zimbabwe en route to assist in a coup in Equatorial Guinea, had rights to diplomatic protection by the South African government in terms of section 7(2) of the Constitution, which provides that, “The state must respect, protect and fulfil the rights in the Bill of Rights”. The majority judgment of the Court found that no such right existed. However, the minority judgments of both Ngcobo J and O’Regan J (with Mokgoro J concurring) held that, under section 3(2)(a) of the Constitution, the entitlement of all South African citizens to the rights, benefits and privileges of citizenship, meant that South African citizens also had the right to diplomatic protection; and that the government had a constitutional duty to grant diplomatic protection to nationals abroad against violations or threatened violations of fundamental international human rights20 (such as the right to a fair trial and the right to life, as in this case). That said, it was left to the state to assess foreign policy considerations and determine whether, when and how to intervene.21 However, this did not mean that such a decision was immune from judicial review. A minority judgement is not binding and does not constitute a precedent. However, in this case, section 7(2) of the Constitution was the section that was advanced before the court and found not to extend diplomatic protection to South African citizens. It was the minority that pointed out that such a right existed in section 3(2)(a) of the Constitution instead. Furthermore, given the nature of the rights in issue, one would expect the courts to take cognisance of section 3(2)(a) in order to provide South African citizens with greater protections abroad. Should that argument be advanced in the future, the outcome in court may be different. The Constitutional Court was required to determine whether or not South Africa had the duty to investigate allegations of crimes against humanity (torture) committed by Zimbabwean officials against Zimbabwean citizens on Zimbabwean soil. South Africa had domesticated the Rome Statute of the International Criminal Court (“the Rome Statute”) through the legislation of the Implementation of the Rome Statute of the International Criminal Court Act 27 of 2002 (“the Implementation Act”). In this case the South African Police Services (“SAPS”) had refused a request to investigate allegations of torture based primarily on foreign relations considerations with Zimbabwe. The Constitutional Court, however, found that South Africa (and SAPS specifically) had a duty to combat torture beyond South African borders. This duty arose from the Constitution read with the Implementation Act. SAPS were accordingly ordered to conduct an investigation into the allegations24, with due consideration given to SAPS resource allocation limitations. When he visited South Africa in 2015 for an African Union Summit, President Al Bashir had two International Criminal Court (“ICC”) warrants of arrest issued against him for international crimes allegedly committed in Darfur. As a consequence, a warrant was subsequently issued domestically by a South African magistrate. In 2009, President Al Bashir had been invited to attend the inauguration of President Zuma, but was warned by the South African authorities that if he attended, he would be arrested. Yet in 2015 the South African government refused to arrest President Al Bashir, hiding behind the veil of head of state immunity. The South African government’s failure to arrest Al Bashir not only contravened international law which it had ratified (and which has special standing in the South African domestic system according to the Constitution) but was in contravention of the domestication of that law – the Implementation Act. In other words, if action is required by the ICC, head of state immunity no longer exists in South African law. After the Al Bashir debacle, the South African Government decided that it no longer wanted to be accountable to the Rome Statute and the domestic Implementation Act. As a result, the executive attempted, in 2016, to unilaterally withdraw South Africa from the ICC and its jurisdiction. The Court was essentially saying that the South African Government is not permitted to take short cuts when it came to constitutionally enshrined domestic processes, based on foreign policy considerations. The executive was accordingly forced to withdraw South Africa’s notice of withdrawal from the ICC, as it had not obtained parliamentary approval. Running into trouble again with Zimbabwe, the South African Government attempted this time to confer immunity on the wife of Zimbabwe’s then president, Grace Mugabe. While accompanying her husband to attend an African Union Summit hosted by South Africa in 2017, Grace Mugabe was charged with assault with intent to do grievous bodily harm committed against a South African citizen. In a rush, the Government conferred immunity on Grace Mugabe from the jurisdiction of the South African courts. This immunity was conferred on the basis of section 7(2) of the Diplomatic Immunities and Privileges Act of 2001, as the Government considered it to be “in the interest of the Republic” to do so. However, this conferred immunity conflicted with a provision in another piece of legislation. Section 6(a) of the Foreign States Immunities Act reads, “A foreign state shall not be immune from the jurisdiction of the courts of the Republic in proceedings relating to the death or injury of any person”. Again, the Government put foreign relations considerations with its neighbour above the Constitution. The Court declared the conferral of such immunity unconstitutional as, in terms of section 6(a) of the Foreign States Immunities Act, President Mugabe himself did not enjoy immunity from the jurisdiction of South African courts for the injury of a person in South Africa. the South African government cannot confer immunity from the jurisdiction of South African courts on the spouses or family members of sitting heads of state for certain crimes – even if it would be in the national interest to do so. The executive may have a wide discretion in determining whether, when and in what manner to apply South Africa’s foreign policy42 (with the judiciary having to “be careful not to attribute to itself superior wisdom”. But the development of foreign policy must be in line with the commitment to human rights and sovereignty pronounced by the courts: the single mechanism responsible for bridging the country’s foreign policy, and its Constitutional and legal obligations. Our foreign policy needs more finesse. Moreover, to ensure that foreign policy serves its rightful beneficiary – the South African public – the policy must fit the constitutional and legislative framework, and not the other way around. Lee-Ann Germanos is legal researcher and Tove van Lennep a researcher at the Helen Suzman Foundation.